These raw and powerful poems have at their heart the charged, archetypal figure of the mother. Conflicted by the twin desires of self-destruction and self-preservation, this mother is both terrible and beautiful. This compassionate, nervy collection of poems shows a family in the aftermath of violence. James Allen Hall explores themes of loss, the intersection of grief and desire, and the ways in which history, art, and politics shape the self. We meet the speaker’s mother in many guises-she is the rogue Republic of Texas, the titular character of Rosemary’s Baby, a nineteenth century artist’s model, a fake entry in an encyclopedia, the lost queen of King Lear. With clarity, wit, and compassion, the speaker discovers the facets of his mother-her own abuse, her years of adultery, her struggle to remain independent-so that he may come to terms with his own sexuality. By seeing his mother in these guises, the speaker understands identity as it develops along and is reclaimed from the most repressive of social margins. Hall’s poems twine the autobiographical impulse with a deeper emotional, somewhat surreal, temperament. This is a book as much about the way we tell our stories as it is about the stories we tell. Now You’re the Enemy negotiates narrative in order to refashion the self-as a way to survive, to learn the redemptive power of love. James Allen Hall is assistant professor of English at Bethany College in West Virginia. 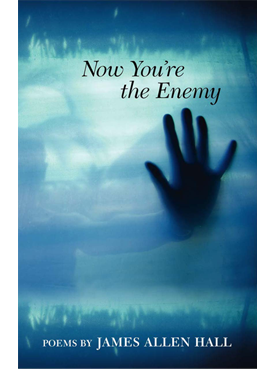 Now You’re the Enemy was a finalist for the Walt Whitman Book Award and a semifinalist for the Crab Orchard/Open Competition Book Award. He’s the recipient of an Academy of American Poets Prize and three Pushcart Prize nominations. 2009 Texas Institute of Letters Poetry Award; Finalist for the 2008 Independent Booksellers’ Foreword Magazine Book of the Year Award; co-winner in the gay poetry category from Lambda Book Awards.